People love food trucks. They’re cheap, they’re convenient and, if you’re a tourist, they allow you to sample some creative local cuisine you won’t find back at home. To help give visitors a taste of Vegas food trucks, the Grand Bazaar Shops at Bally’s Las Vegas on the Strip is hosting some local trucks this summer. Participating trucks include Bacon Boys, which celebrates all things bacon. You’ll find sandwiches like the Fluffernutter with marshmallow, bacon and Nutella and the W.T.B. What the Bacon, an awesome BLT. Of course you can add extra bacon to any order. Bacon Boys will be at the Grand Bazaar Shops through August 27 from 10 a.m. – 10 p.m.
Other trucks include Island Time Floats, which serves Dole Whip in a pineapple. Trust us, you’ll want to try this cool treat. It comes in float and shake form. Tamago burger. Photo courtesy of Las Vegas Weekly. Fukuburger: One of the city’s most popular trucks is Fukuburger and you can find them on the Strip at the Hawaiian Marketplace (just south of Harmon Avenue) Sunday – Thursday from 11:30 a.m. – 11 p.m. and Friday and Saturday until midnight. Now the Strip location isn’t a truck, but more a walk-up kiosk, but you still get the same great food and vibe. 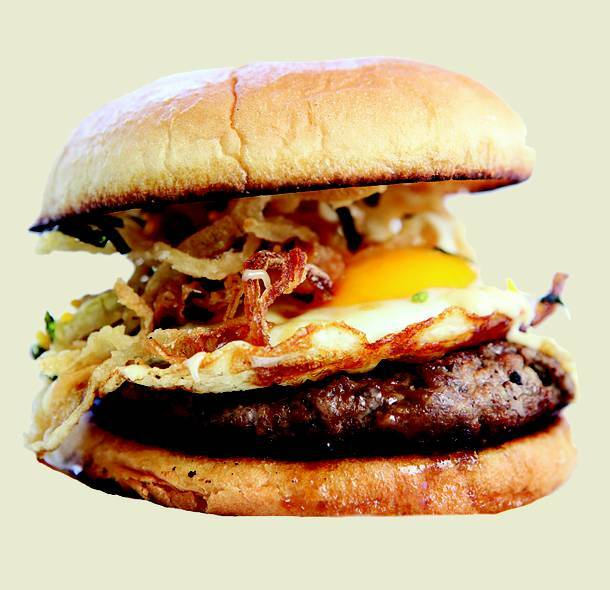 Fukuburger serves burgers with a Japanese twist. The Fukuburger is an all-beef patty with American cheese, lettuce, tomato, onion, wasabi mayo and Fuku sauce. If you want your burger with more Asian flair, try the Kinoko with grilled shitake mushrooms, pickled red ginger, teriyaki and wasabi mayo. The truck also serves sides including garlic fries and jazz fries, which have brown gravy and “crack” sauce. If burgers aren’t your thing, Fukuburger also has the Naga Dog, a hot link topped with kimchee, daikon relish, wasabi mayo, spicy kabayaki and harinori. 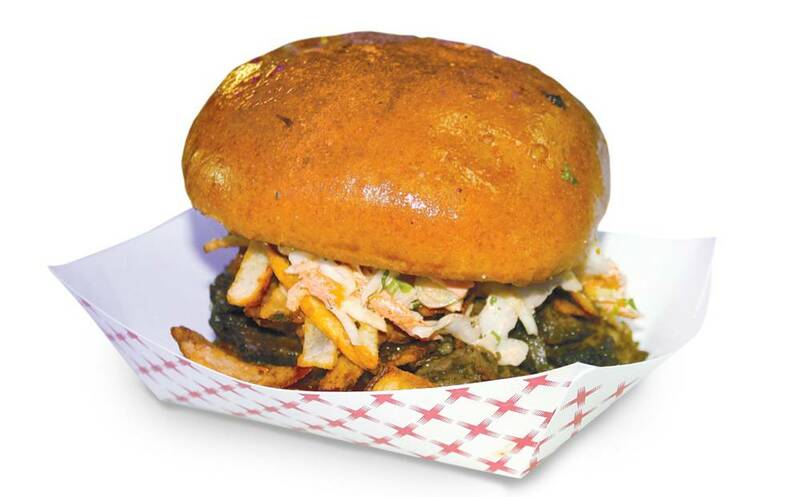 For locations, follow @fukuburger on Twitter. 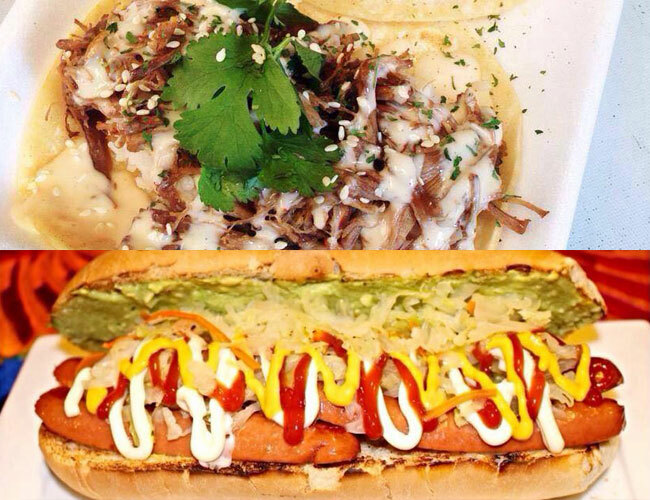 Asian fusion tacos from Dragon Grille (top) and El Chapin from El Shuko (bottom). Photos by Dragon Grille and El Shuko. Dragon Grille and El Shuko: We’ll be honest, we’re kind of tired of hearing the word fusion applied to every cuisine type out there. But while we may be tired of the word fusion, we’ll never grow tired of Dragon Grille’s Korean and American fusion. Go for the tacos and dragon fries – beer battered dipped fries topped with Korean beef brisket, Balbi Q sauce and Furikake. Also, check out their sister truck El Shuko. We’re avoiding using the word fusion again, so just think of it as what would happen if a hot dog was mashed up with the flavors of Guatemala. Try the El Cherote with carne asada, guacamole, boiled cabbage, mayo and Guatemalan chimichuri. Or have the El Chirmolero with Spanish chorizo, guacamole, boiled cabbage, mayo and Guatemalan chirmol (roasted tomato salsa). 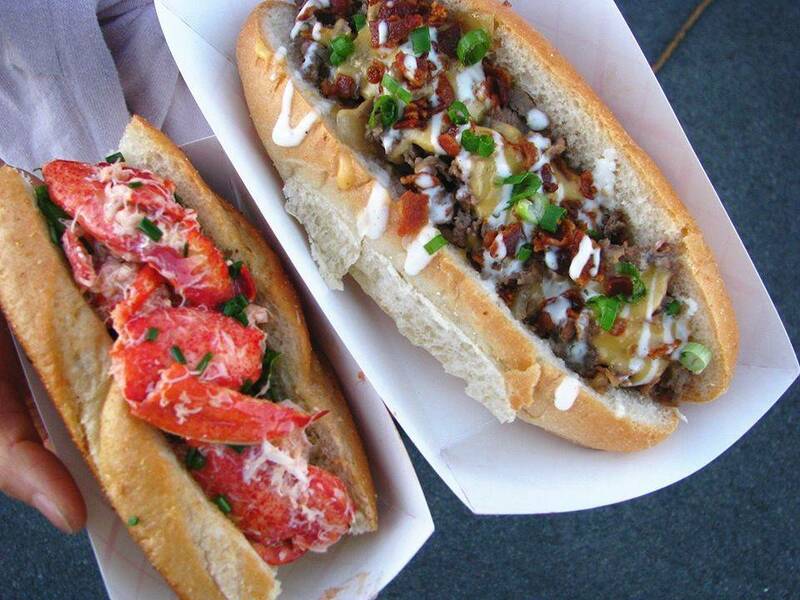 For locations, follow @DragonGrille and @ElShukoTruck on Twitter. Coast2Coast Deli. Photo courtesy of Las Vegas Weekly. Coast 2 Coast Deli: If you’re craving a sandwich, you’ll definitely find something at Coast 2 Coast. They serve deli-style sandwiches with a modern twist. If you’re a West Coast fan, try The San Fran: breaded chicken cutlets, melted cheddar, bacon, Thousand Island, lettuce and tomato. If you like East Coast style, go for The Brooklyn with fresh cut pastrami, caramelized onions, Swiss cheese, coleslaw and waffle fries topped with Thousand Island on toasted garlic marble rye. For locations, follow @Coast2CoastLV on Twitter. Stripchezze: Have a passion for cheese? So do the folks who run this gourmet grilled cheese truck. In Vegas you’ll want (or need) to try The Hangover with grilled summer sausage, drunken onions, pepper jack cheese served on two warm pretzel buns with beer cheese spread. Spice things up with the Hot Streak – pepper jack cheese and jalapeno peppers with Sriracha mayo on Parmesan and Flamin’ Hot Cheeto crusted sourdough. The truck also serves sides like tomato soup and Vegas Strips – deep fried wonton strips sprinkled with cinnamon sugar. For locations, follow @stripchezze on Twitter. Sauced. Photo courtesy of Las Vegas Weekly. 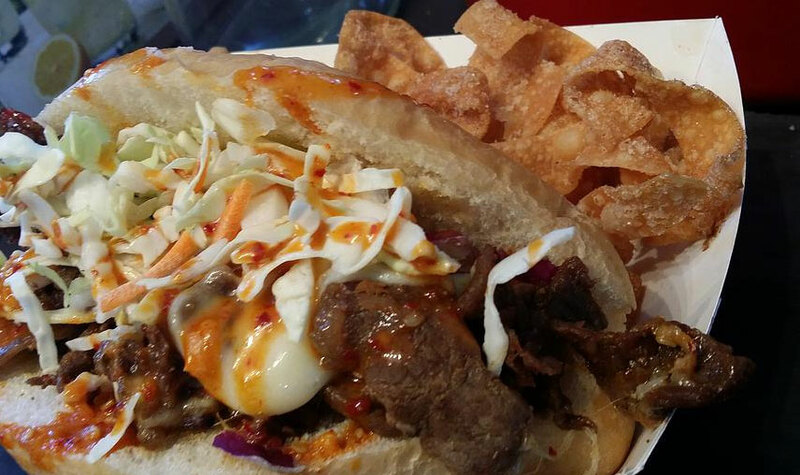 Sauced: Tapas with a gourmet twist is what this food truck promises. We like the Big Easy Balls – Cajun chicken and Andouille sausage mixed with risotto and garlic herb cream cheese. On the lighter side there’s the Chicken Tsunami Taco – chicken grilled in Thai coconut sauce, topped with Asian slaw. Another favorite is the Over the Limit Fries – topped with brown ale cheese sauce, bacon and jalapenos. For locations, follow @SaucedVegas on Twitter. 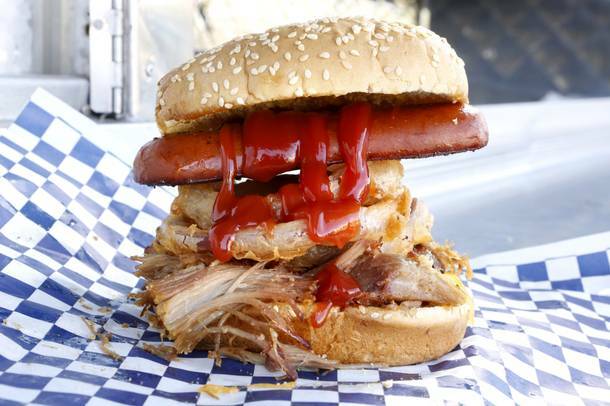 Truck U Barbecue.Photo by Brock Radke / Las Vegas Weekly. Truck U Barbeque: This truck, run by Food Network star chef Mike Minor, serves slow smoked barbecue with sticky molasses sweet barbecue sauce. The menu is divided into barbecue tortas, barbecue tacos and burritos. Tortas incluce a chipotle brisket or short rib. For tacos there’s blackened catfish, fried chicken and barbecued pork. If you want a burrito, go for the Burnt Ends and Fries – slow smoked burnt ends, Oaxacan barbecue aioli, coleslaw, duck fat fries and Monterey Jack. Other menu items include the Mexican corn cones with choclo corn, cotija cheese, chipotle aioli and chile lime butter. For locations, follow @TruckUBarbeque on Twitter. Rika Arepa Express. Photo courtesy of Las Vegas Weekly. 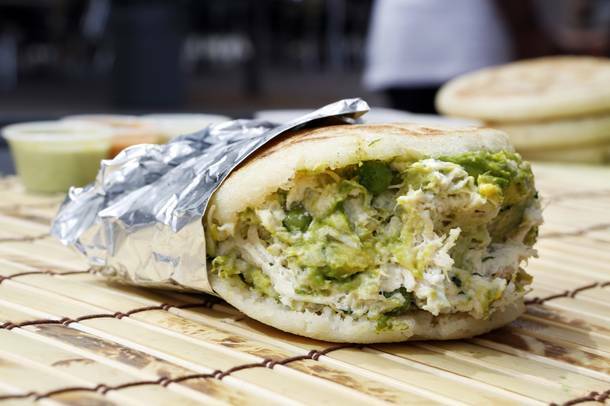 Rika Arepa Express: Don’t know what an arepa is? Trust us, you’ll want to visit this truck and find out. It’s a favorite Venezuelan bread made with cornmeal, water and salt, cooked on a griddle and stuffed with ingredients. Try La Reina with shredded chicken breast, avocado, green peas, cilantro, celery and citrus dressing or La De Carne with stewed, shredded beef, mixed greens, cheddar cheese and Rika sauce. For locations, follow @RikaArepa on Twitter. Got a Vegas food truck you think we should be food stalking? Let us know in the comments below because we’re hungry, really hungry.